A perfect company promo car! It’s no surprise that company promo cars are often the most outrageous and eye-catching modified vehicles in existence. 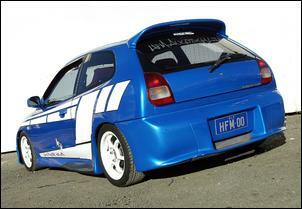 Just take a look at the Hi-Fi Mart/HFM Auto Styling high-impact Mitsubishi Mirage. If its body kit and graphics don’t catch your eye, chances are you’ll notice the thundering sound system or spoolin’ turbo! Warwick Butzbach – joint owner of Toowoomba’s Hi-Fi Mart and HFM Auto Styling – purchased this 1998 Mirage about 8 months ago after recognising its huge marketing potential. Warwick tells us the Melbourne-built Mirage had already been fitted with a DOHC turbo engine, custom interior, body kit and custom paint. All that it needed was some fine tuning, a few alterations to gain Queensland registration, company graphics and a suitably arse-kicking sound system. We are told the previous owner of the Mirage went through various stages of engine modification, including a supercharger and extra injector set-up. 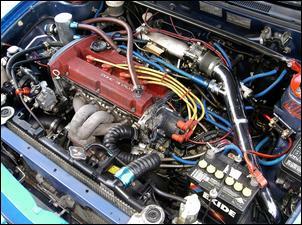 However, when the car came to Warwick , it was equipped with a Japanese import 1.5 litre DOHC 16-valve engine teamed with a custom turbo arrangement. Internally, the DOHC engine has been rebuilt with Ridgecrest H beam rods, a reground crankshaft, forged pistons (for a static compression ratio around 8:1) and a ported cylinder head. 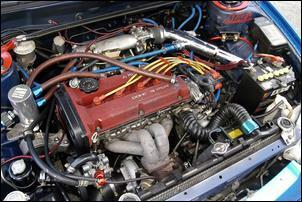 It’s the perfect platform for a relatively high boost turbo application. 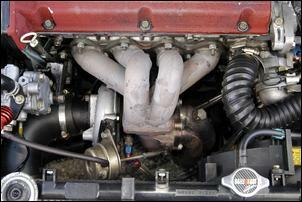 The engine’s blow-by oil is kept out of the intake tract thanks to a custom catch can. On the exhaust side of the head is a custom tubular manifold that connects a Nissan 200SX T28 turbocharger blowing at up to 16 psi boost. A 2½ inch mandrel exhaust (with a dual passage dump pipe) and HKS pod filter let the turbo breathe with minimal restriction. A large aftermarket front-mount intercooler, custom mandrel bent intercooler plumbing and GFB blow-off valve complete the turbo system. Controlling fuel and ignition is a Wolf 3D programmable management system. A set of Evolution 7 injectors and an aftermarket fuel pressure regulator were installed when the car was purchased and Warwick has since added an Evo 7 fuel pump to maintain safe mixtures at high rpm/load. This required another tune of the Wolf management system. Using a heavy-duty clutch teamed with a stock 5-speed gearbox, Warwick ’s Mirage has put out 200hp (149kW) at the front wheels on a Dyno Dynamics chassis dyno. This gives the Mirage a power-to-weight ratio superior to a current Subaru Impreza STi – just the thing to make a lasting impression! Visually, Warwick ’s Mirage wears a Cyber body kit fitted by the previous owner. The kit (which is distinctive without being plain weird) comprises front and rear bumpers, side skirts, rear spoiler and bonnet vents. 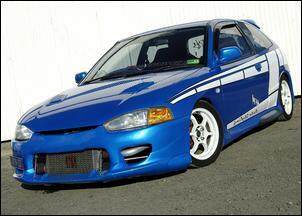 A non-factory paint job is another eye-catcher – the paint is a custom metallic blue mix. Warwick has also added a stick-on graphic kit promoting HFM Auto Styling. Oh, and look closely at the tailgate and you’ll also see a KOMPRESSOR badge as fitted to Mercedes-Benz models. The body rides m-u-c-h lower than standard thanks to an aftermarket spring and damper combo and the front strut towers are tied together with a carbon fibre brace. A set of 225/40 Bridgestone rubber (as big as you’ll fit on a Mirage) is worn on white Enkei 15 inch alloys. The task of blackening those rims is the responsibility of standard four-wheel disc brakes. These also serve to slow the car when the brake pedal is pressed – a bonus! 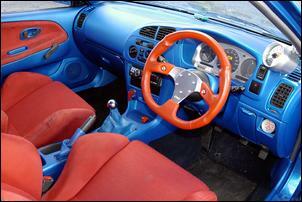 The custom blue paint on the exterior panels also extends to the Mirage’s interior. Blue paint covers the dashboard, centre console, scuff panels and pillar trim pieces while a red-trimmed Isotta steering wheel, door inserts and Recaro seats add contrast. The base-spec Mirage instrumentation is augmented with an A-pillar mounted tachometer and an AutoMeter boost gauge. A cool head-up display (HUD) unit also provides rpm and road speed data on a reflective panel stuck on the windscreen. Other interior features include an aluminium gear knob, a leather boot for the gear knob and handbrake lever, Blitz turbo timer and silver painted main instrument surround. 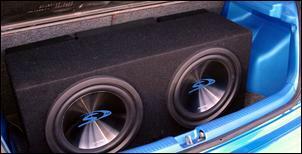 The audio system is a top-shelf thumper using all Alpine components. A top-of-the-range CD/tuner/MP3 head unit is wired to a trio of V12 amplifiers, dual Type S 12 inch subs (mounted in a sealed enclosure), 6 inch front splits and 6 x 9 inch 3-ways in the rear. High quality RCA leads, heavy-gauge speaker wire and a gold-plated fuse block ensure maximum sound quality. And is it loud? You bet! With up to 145dB output, the HFM Auto Styling Mirage can be heard from the next town! Warwick says the Mirage has served well in drumming-up business and promoting the company name, but he’s now on the lookout for a new promo machine. As a result, the Mirage is currently being offered for sale (at around AUD$18,500 minus sound system) and Warwick is considering a BMW 535i turbo currently owned by his business partner.